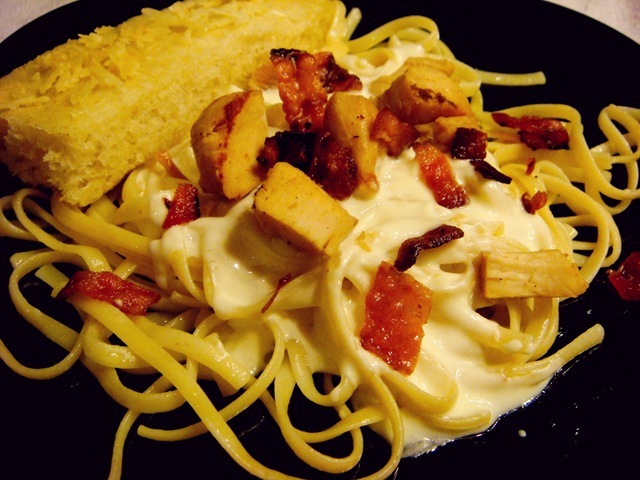 No fancy recipes today: just some good old fashioned comfort food. And a great way to use leftover chicken (or turkey) and vegetables. 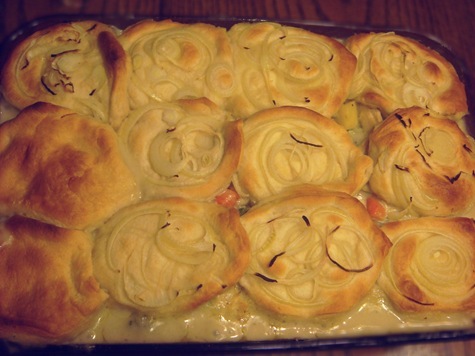 This is a basic recipe for chicken pot pie with two different crusts: the traditional pie crust or refrigerator biscuits topped with thinly sliced onions. 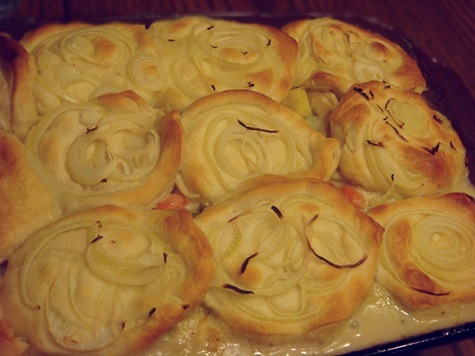 A pot pie is such a versatile meal because you can use whatever vegetables you have on hand. I almost always include some potatoes, carrots and onions, but the other green vegetables vary. Small amounts of leftover veges are perfect, but you can also use frozen vegetables. I do not thaw or cook frozen broccoli, beans or peas before adding them to the casserole dish. They will cook through while the whole thing is baking. Precooking will make them mushy. The potatoes, carrots and onions do need to be cooked first. I almost never make this starting with raw chicken, but you certainly can. I prefer to wait until I have leftover chicken or turkey from a roast chicken (or Thanksgiving turkey) or extra shredded chicken from another meal: like these Enchiladas. 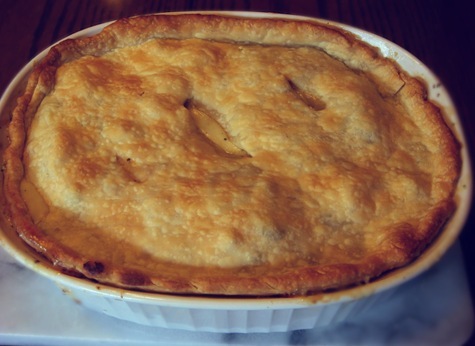 You can top your Pot Pie with a traditional Pie Crust (either homemade or refrigerated). I do not use a bottom crust, just a top one. Just be sure to place a sheet of foil or a baking sheet on the oven rack beneath the pot pie to catch any drips. If you are deciding what to put in your herb garden this spring (assuming the snow stops someday), I loved these two varieties of sage that I planted last year (a variegated silver and purple). Replacing the ground sage in the recipe with fresh chopped sage is really delicious. I can’t wait until I can use my own fresh herbs again! For a twist on the traditional pot pie filling sauce, try adding 1/2 to 1 cup of prepared Pesto to your sauce. It makes a great change! My family really likes this biscuit topping on their pot pie. Starting with a can of refrigerator biscuits, divide biscuits in half cross-wise (into 2 thinner round biscuits). Flatten slightly with your hand. Press a slice of very thinly sliced raw onion into the top of each biscuit half. The filling needs to be cooked partially before putting the biscuits on top, or the underside of the biscuits will be doughy while the tops burn. But if you cook the filling until it just starts to bubble and then lay the onion-topped biscuits over the hot filling in the pan, everything will come out perfect! Most of our family loves the onions on top, but I do leave a couple of biscuits plain for those who object. Any extra biscuits that do not fit on top can be baked separately as directed on the package. If you are starting with raw chicken, boil chicken until tender, remove from broth (do not drain broth) and chop. 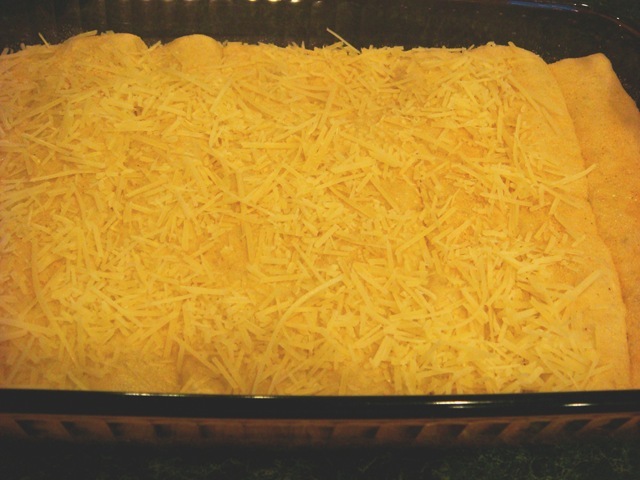 Place in 3 qt casserole dish. Cook potatoes and carrot in remaining chicken broth (or water if not starting with raw chicken) until potatoes are just tender; drain. 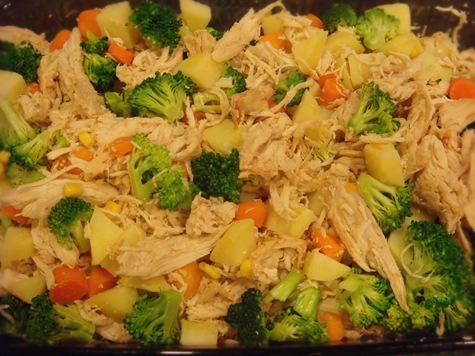 Add potatoes and carrots to casserole dish with chicken and chopped zucchini. Add frozen beans, corn, broccoli and/or peas (do not thaw). Melt butter in the same skillet. Sauté onion until soft. Stir in flour; cook 3-4 minutes until roux is light brown. Using a whisk, stir in marjoram, sage, salt and pepper. Stir in chicken broth and milk. Whisk until smooth. Cook until thickened and bubbly. Pour over chicken and vegetables in casserole dish. Arrange pie crust over dish, sealing to edge of casserole dish. Flute edges. Cut several slits in top of crust. Place a cookie sheet or layer of aluminum foil on bottom rack to catch drips. Place pot pie on center rack. Bake at 425°F for about 30 minutes, until filling is bubbly. Instead of a pie crust, use refrigerator biscuits. Divide biscuits in half cross-wise (into 2 thinner round biscuits). Flatten slightly. Press a thin slice of raw onion into top of each biscuit half. Cook filling, uncovered, for 20-25 minutes at 425°F, until hot and bubbly. Lay onion-topped biscuits over hot filling in pan. Reduce oven temperature to 350°F and cook for 20 minutes, or until underside of biscuits are cooked through (they will still be soft and have a dumpling consistency on the bottom, but you don’t want raw dough). If top of biscuits brown too quickly, cover with foil. If you have extra biscuits, bake separately as directed on package and serve with the pot pie. Just a quick post for an easy to make traditional Sunday meal: roast beef and gravy. 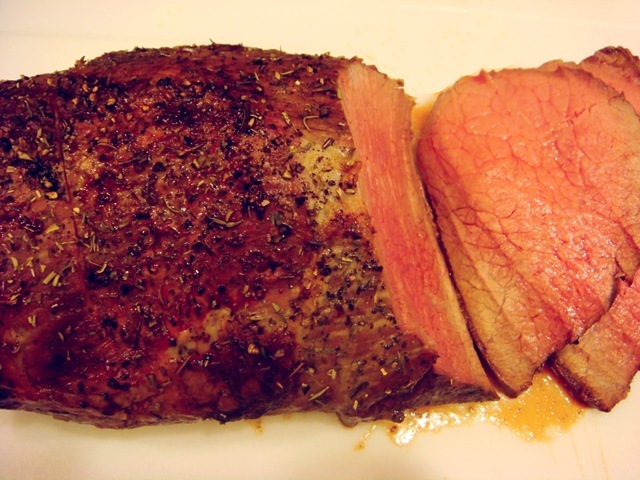 This roast uses an eye-of-round cut, and should be served medium-rare to medium. It will not be nearly as tender if it is overcooked. I do not use a thermometer to make this, but as all ovens are a little bit different, you could you a probe thermometer to make sure that your roast is cooked to your liking. 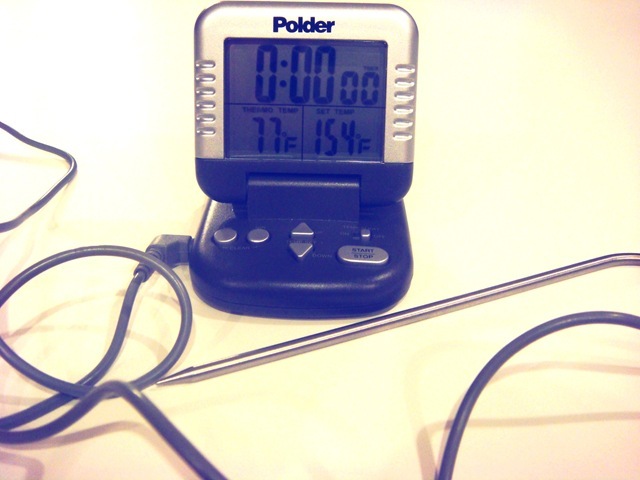 This is a probe thermometer. The temperature probe stays in the meat the entire time in the oven, while the temperature gauge stays on your countertop. You can also set an alarm to sound when your roast hits a certain temperature. When you are making this roast, you DO NOT want to open the oven. This roast starts at a very high heat: 500°F, and after an initial sear in the hot oven, it slow roasts in a cooling oven for another 2 1/2 hours. Use whatever seasonings you like: this has salt, pepper, garlic, spicy paprika, rosemary and bay leaves. Simply place your roast on a rack in a roasting pan and sprinkle with seasonings. Season the roast with desired seasonings. Place on a rack in a roasting pan. Do not cover or add water. Place the roast in the preheated oven. Reduce temperature to 475°F. Roast for 20 minutes (or about 7 minutes per pound). Turn off the oven and let the roast sit in the hot oven for 2 ½ hours for medium rare. Do not open the door. Carve into thin slices to serve. Serve with mashed potatoes and Beef Gravy. If you are preparing gravy for a roast beef, remove roast from pan and set on a grooved carving/cutting board. If your roasting pan can be used on the stovetop, drain any liquid in the roasting pan into a small bowl (do not throw away). Add butter to the roasting pan and turn stove onto medium heat. If your pan cannot be used on the stovetop, scrape liquid and browned bits from pan into a small bowl, then melt butter in a skillet. Stir melted butter until browned bits are removed from bottom of pan. Stir in flour and cook 4-5 minutes, whisking constantly, until roux is a deep brown color. Stir in beef broth while whisking constantly. Stir in Kitchen Bouquet, pepper and reserved pan drippings. Bring to a boil. Simmer 5-10 minutes, or until ready to serve. Taste; add salt if necessary. **As you carve your roast, add any drippings from roast to the gravy before serving. 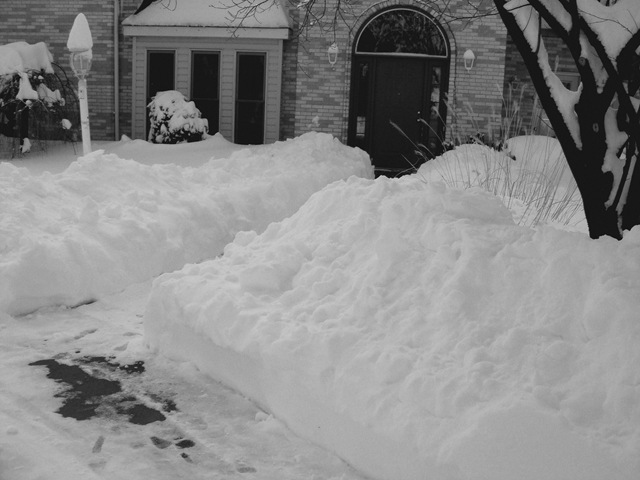 We woke up this morning to a beautiful world of winter white! 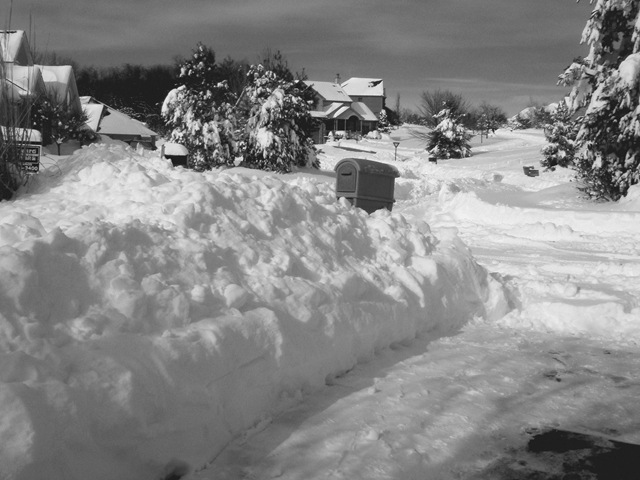 The kids’ only complaint: that it happened on a Saturday. After spending several hours digging our driveway out from the storm (no snow-blowers here), I was ready to warm up the house (and me) with some good old-fashioned comfort food. Beef Bourguignon and some Whole Wheat Bread were just what I needed. This had to wait, of course, until I was done helping kids in and out of snow clothes half-a-dozen times during the day (and mopping up puddles of melted snow). And making lots and lots of hot cocoa! 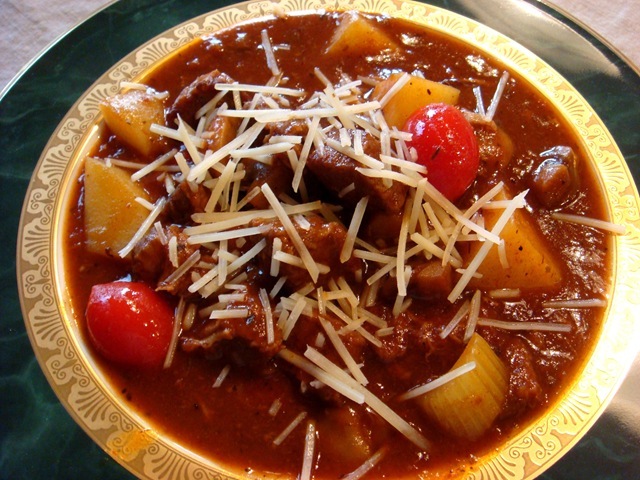 I know you are thinking that this is just a glorified beef stew, but it is so much more! This Beef Bourguignon is packed with flavor, and is thick and hearty, just begging for a slice of bread to mop up all of the leftover goodness in the bottom of your bowl. And did I mention bacon? Some of the heartiness (and tons of flavor) in this stew comes from first cooking some (okay, a lot) of chopped bacon in your stock pot. Remove the cooked bacon (to be added back later, of course), drain most of the bacon grease, leaving a couple of tablespoons in the bottom of the pot to brown your beef cubes in. I used some leftover roast beef from a few nights ago. Brown it up nicely in those bacon drippings and then add some mushrooms and onions. I like to remove most of the alcohol from the red wine, so I add it first, and then reduce it almost dry before adding in the rest of the liquids. 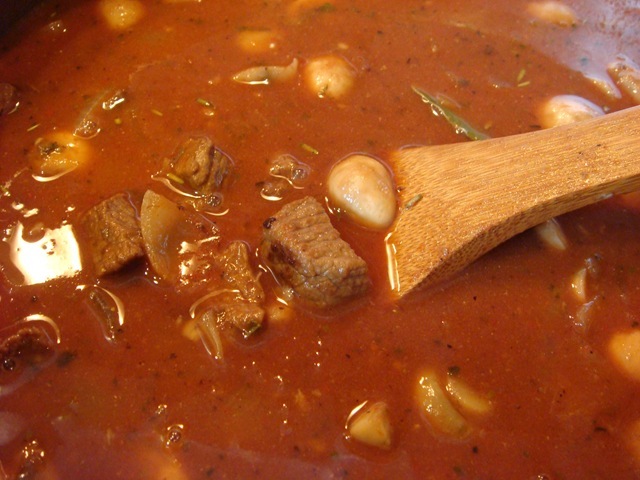 Stir in some broth, tomato paste and seasonings and let it simmer for an hour or two to get your beef nice and tender. Add carrots, potatoes and celery and continue cooking until those vegetables are tender. Add some cherry tomatoes just before serving. They will soften perfectly just from the heat of the stew. Adding them too early will turn them to mush, and you’ll just have floating tomato skins in your bowl. Waiting (patiently? 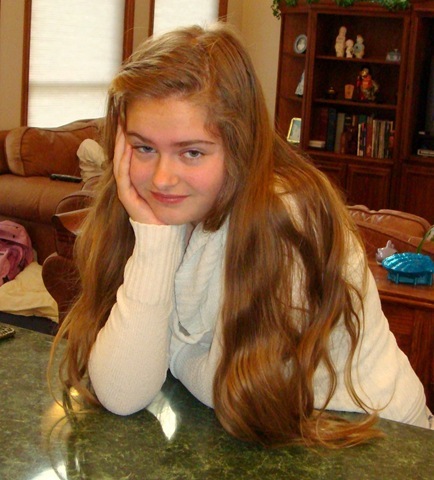 not-so-patiently?) for mom to snap a few pictures before serving dinner! After a long day of fun in the snow, a good hearty bowl of stew sure hits the spot! Cook bacon in a large pot. Remove from pan when cooked. Drain most of the grease, leaving about 2 Tbs in the pot. Brown the beef cubes in the bacon drippings. Add mushrooms (quartered if they are large) and chopped onion (if you are using pearl onions, wait and add them with the potatoes later). 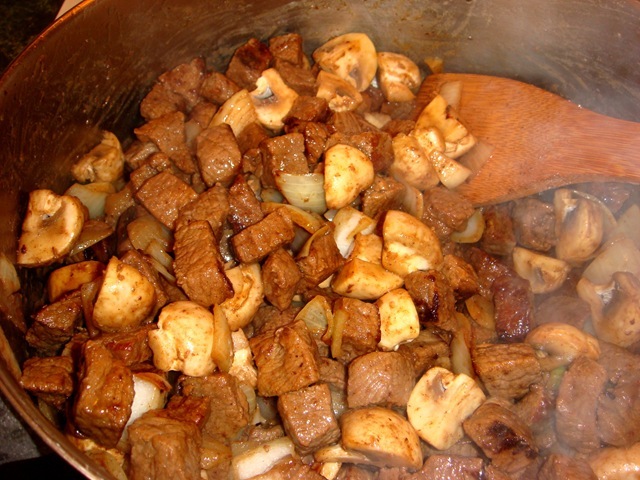 Cook for about 5 minutes, or until onions and mushrooms just begin to brown. Add the wine and let wine reduce for 10-15 minutes, or until almost completely evaporated. Add cooked bacon, beef broth, bay leaf, Italian seasoning, tomato paste, mustard, Worcestershire sauce, garlic, pepper, salt, tapioca and pearl onions. Bring to a boil. 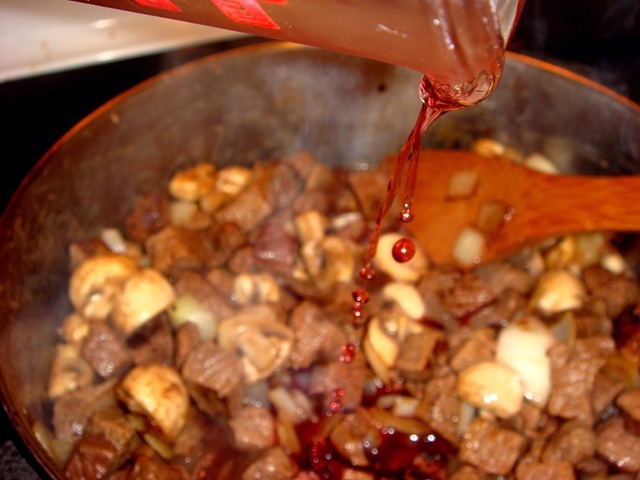 Cover, reduce heat and simmer 1- 1 ½ hours. Stir in potatoes, carrots and celery. Add additional water if stew is too thick. Cook until vegetables are tender. Taste and add additional salt, if necessary. Add tomatoes 5 minutes before serving. Remove bay leaf. 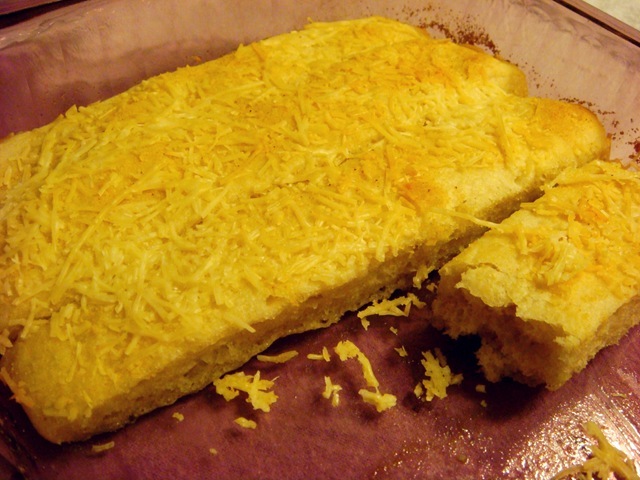 Serve with Parmesan cheese and hot bread. Mix wet ingredients. Add dry ingredients. Mix in enough additional flour to make a moderately stiff dough. Knead 5-6 minutes. 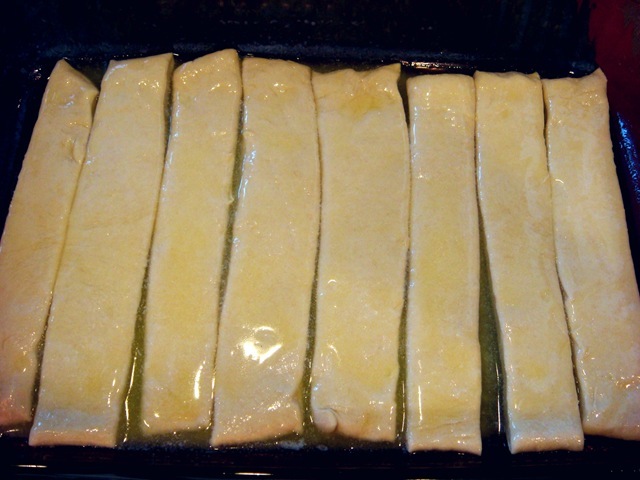 Divide dough into 3 greased medium-sized loaf pans (or 2 large). Brush with additional oil, cover and let rise until doubled in size. Bake at 350 °F for 35-40 minutes. Remove from pans; cool. 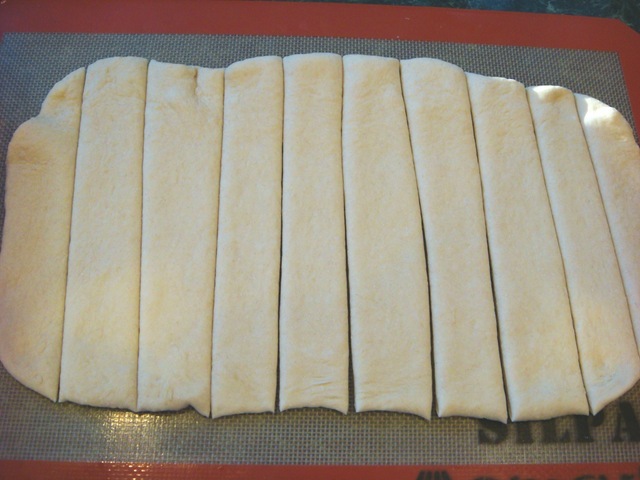 TO MAKE ROLLS: Shape into desired shapes. Place on greased pans; brush with oil, cover and let rise until doubled in size. For a shiny roll: brush with slightly beaten egg white just before baking. Bake at 375 °F for 15 minutes. ***Note: If using instant yeast, the dough only needs to rise once (in the pans). 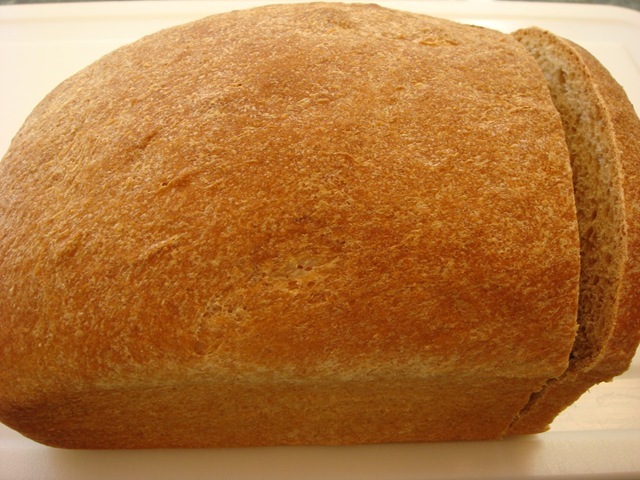 If using regular yeast, allow dough to rise before putting in pans, then rise again in pans before baking.